The old dam is easy to find with a dept finder. Just come out north about 700 yards from new dam, look at both sides of the lake (when the water is low), line up the two hills that made the old embutments and you are there. When the lake is up, the top of the dam will be at a depth of about 100’. When the lake is down you’ll find the top of the old dam is at 35′ to 40’. The depths off both sides (north and south) will be about 150 to 175′. The old river channel will be the deepest point. I found some great photos of the ‘old’ waddell dam as it stood and pics of the breaching when the new dam was finished. PhxSki, Bill W., also directed me to several old pics at the library of congress. THX Bill. 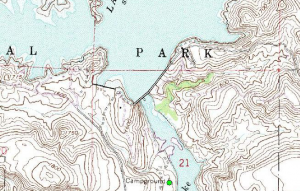 Below is an old topo of the 1922 dam and spillway. This dive report is from Garrett. 10/28/06: 12 of us chartered the local dive boat, the for a scuba diving excursion to the Old Waddell Dam. This dam is completely submerged and was breached in 1992 when the new Waddell/Pleasant Dam was completed about 1/2 mile up-stream, which added about 6,300 surface acres to the lake, tripling it in size. When the old concrete dam was built in 1927 is was the world’s largest multi-arch dam. 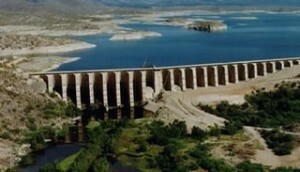 On this day the top of the dam was at a depth of 63′. 1st Dive: My buddy, Weldon and I explored the Arches on the down river side (see pic left), pictures don’t do it justice size wise, they are enormous, probably 25-30′ deep concaves, hit a max depth of 107′, could’ve gone down a lot further. You can still see wood and nails everywhere from the construction in 1927. 2nd Dive: Buddy and I traversed the breach (see pic), it’s 224 ft. long, we thought it would never end, someone was kind enough to string a guideline across the breach or we wouldn’t have attempted it. Apparently the breach is 70′ deep so the bottom of the breach would be at approx. 133′, I have no idea how deep the rubble is. On the other side of the breach we explored the up river side. Made our long way back across the breach, did some further exploring, max depth reached 89′. I did a lot of research on the old Waddell Dam built in 1922. 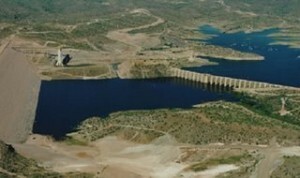 Upon completion, the historic Waddell Dam was the largest multiple-arch dam in the world. The dam rose almost 200 feet above bedrock, and spanned more than 2,000 feet across the Aqua Fria River valley. 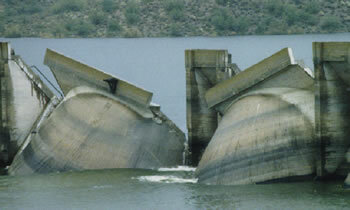 Upon completion of the new Waddell Dam in 1994, the old dam was breached to allow water through. A 224-foot wide breach was cut and two dome sections were dropped into Lake Pleasant in December of 1992. The breaching allowed the new expanded lake to fill in front of the new dams. 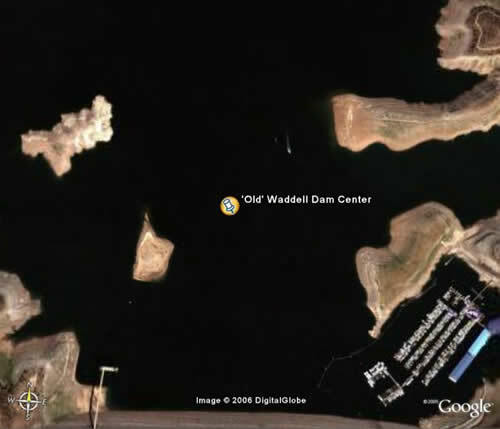 The remains of the old Waddell Dam lie an average of 65 feet beneath modern-day Lake Pleasant. Except for the two-arch breach, the old dam stands complete, about a half mile north of the “New” Waddell Dam. Diving the old dam requires A minimum of Advanced Open Water Scuba Certification because the depth often exceeds 60 feet. On the South end of the dam you can peer into the “rooms” formed by the huge “arches and buttresses” of the dam. Diving to the south end is not for the timid. The dive begins at the top of the dam. 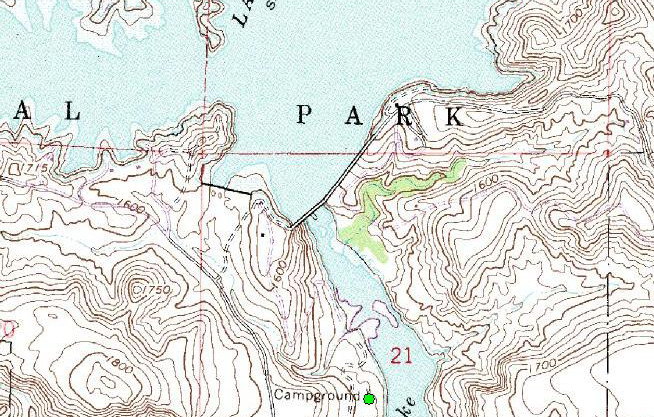 From there, you move out over the old river canyon, and dive along the arches on the face of the dam to the “breach.” There is a rope that leads from one side of the breach to the other. You can swim through the breach around to the back(south) side of the dam, and cruise along the buttresses, looking up into the overhangs and caverns formed by this magnificent structure.